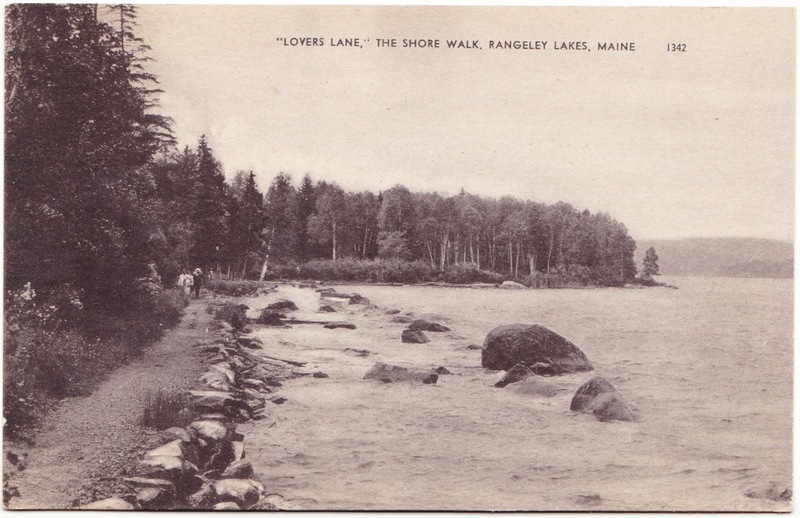 This old postcard from the American Art Post Card Co. of Boston is labeled "'LOVERS LANE,' THE SHORE WALK, RANGELEY LAKES, MAINE." According to the Maine Office of Tourism's visitmaine.com website, the Rangeley Lakes region "consists of six major lakes plus hundreds of smaller lakes, ponds, rivers, and streams stretched out below 4,120-foot Saddleback Mountain." These days, the area is fairly built up for vacationers. Recreational options include "The Ducks," a pair of lakeside camps; a $300-per-night log cabin rental home complete with 1,000 feet of private shore front and DirecTV; regular seaplane trips and much, much more. I couldn't determine whether there's still a portion of the lakefront that's referred to a "Lovers Lane" and, if there is, whether it's public or private. We're going to need a regional expert to help with that one. "Although this picture isn't in color its [sic] a beautiful place to walk after a day of work. You can't see them but there are lots of cottage along the way." Illustrated map of "Desert of Maine"
Brochure for "Sightseeing Pleasure Tours of Portland Maine"